Wilson Shieh lives with his wife and two cats in a high-rise apartment in Kennedy Town. The renowned ink artist was born and raised in the neighbourhood, which has undergone rapid development since the arrival of the MTR. When he was a boy, Shieh’s family lived in shophouse built in the 1920s, a type of building that has vanished from his old stomping grounds. Kennedy Town’s transformation from quiet working-class neighbourhood to upmarket district has not been all that pleasurable to witness. “Change is good for some people, but not so good for other people,” says Shieh. This sort of ambivalence is what colours much of his thoughts on the unfolding story of Hong Kong’s cityscape. It is something he tracks through his work, which is inspired by Gongbi, a traditional Chinese style of ink painting that involves fine brushstrokes on silk, but which also has modern and non-Chinese influences. 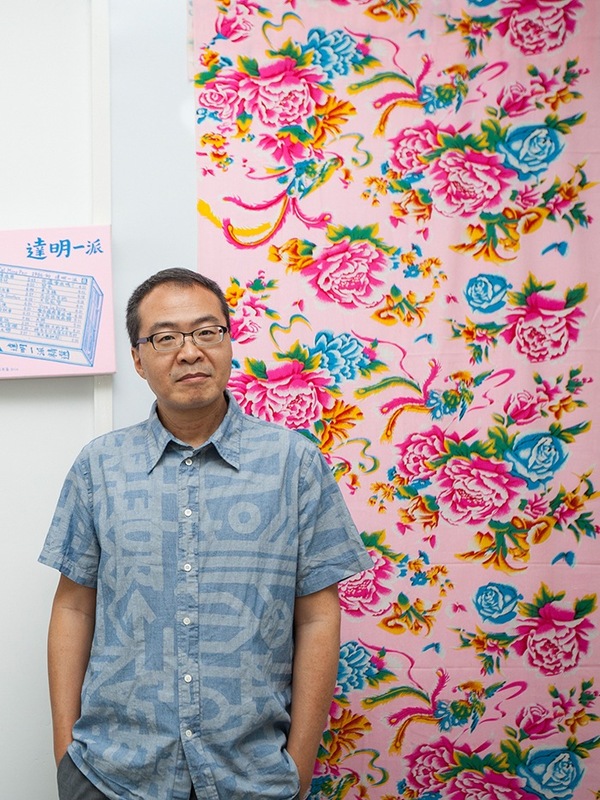 While Shieh lives in Kennedy Town, he commutes every day to his studio in Fotan, a New Territories suburb whose old factory buildings have become home to dozens of artists. 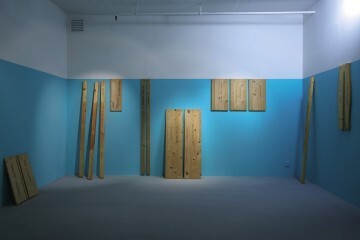 His studio overlooks a hillside near a nullah, along which dai pai dong-style restaurants serve up local Cantonese fare. This is a district where artists rub shoulders with garage owners, and in the past 15 years, it has become a popular spot for creatives wanting affordable studios with high ceilings, big windows and ample space. At its peak, Fotan was home to 90 artists, but this number has declined as rents rise and other districts beckon – though a sizeable community remains. 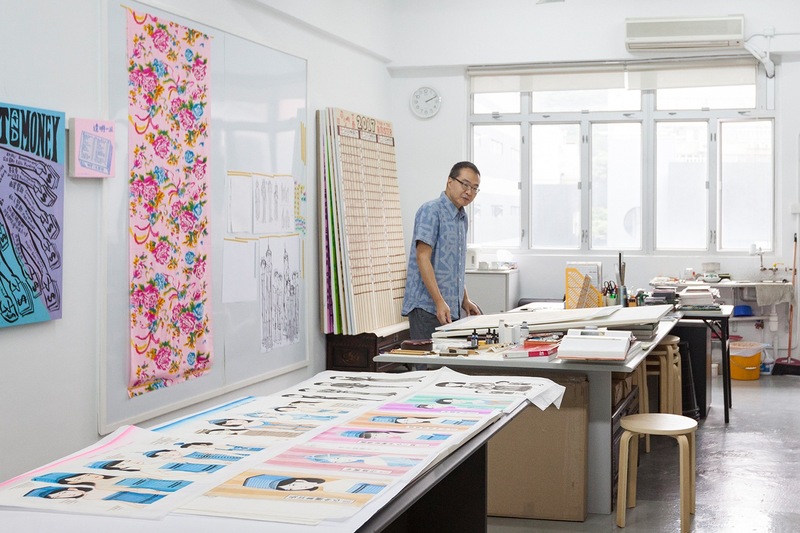 Shieh enjoys the stillness of his studio, the sunlight splashing in from the vast windows, and the chance to spread out his work in a big space. Hanging on the wall are pencil sketches of buildings, alongside a pile of new ideas and inspirations. Known for his Hong Kong cityscapes, Shieh is branching out to depict skylines across Asia. And while many of his influences are local, his workspace contains a treasure trove of influences. Among them are books on tattoos, a replica Edward Hopper painting, and a pile of CDs that range from Hong Kong rock giants Beyond to milder jazz and classical music. Each disc helps spark different moods for different creative states, Shieh explains. 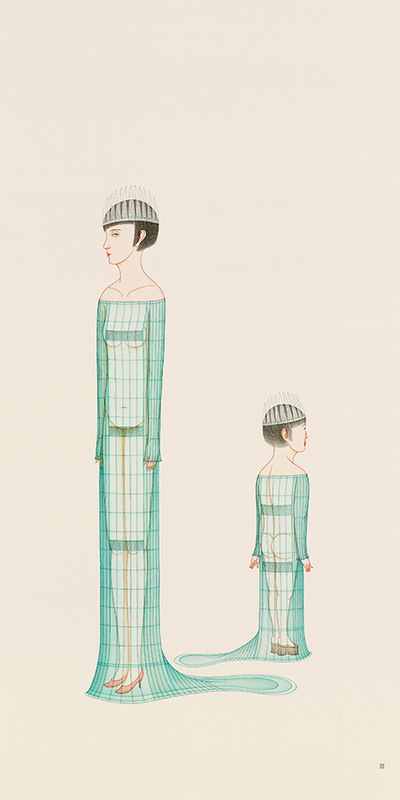 Shieh’s most iconic work is a series of ink paintings that interpret the city’s skyscrapers as women (and occasionally men), some of which are now featured in Ambiguously Yours, the M+ Pavilion’s exhibition on gender in Hong Kong pop culture. 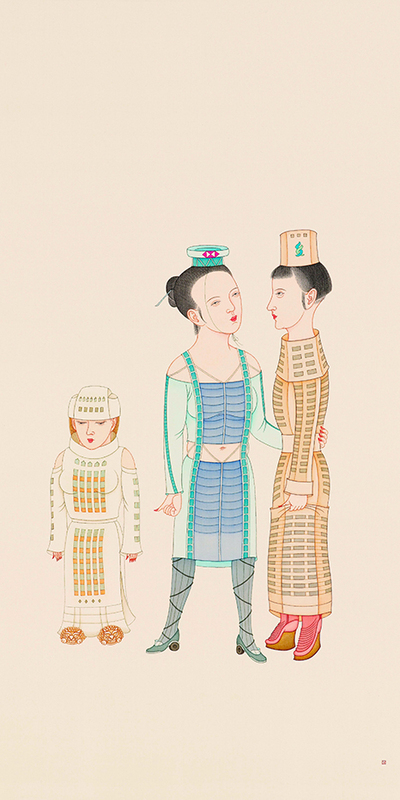 Since the beginning of his artistic career, Shieh has been inspired by the interplay of masculine and feminine energies, blurring theses boundaries in subtly subversive ways that explore and add nuance to the gender binary. He often plays with the themes of sexuality and attraction. A particularly curious work of his, not shown at M+, depicts a couple with snail-like backpacks, implying hermaphroditism. 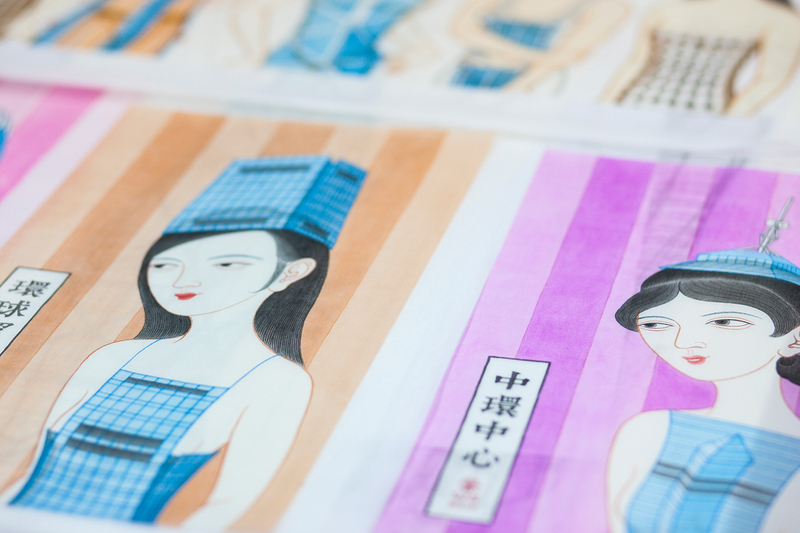 The architecture-themed works on show at M+ are painted on silk, true to traditional Gongbi style. The buildings featured include the ICC, Hong Kong’s tallest, as well as older landmarks such as the porthole-windowed Jardine House. 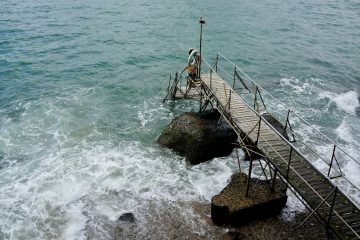 And while he documents Hong Kong’s changing landscape, he refrains from overtly criticising these changes. He says he prefers, in his own way, to record the upheavals of urban terrain, as quaint old structures continue give way to gleaming towers. 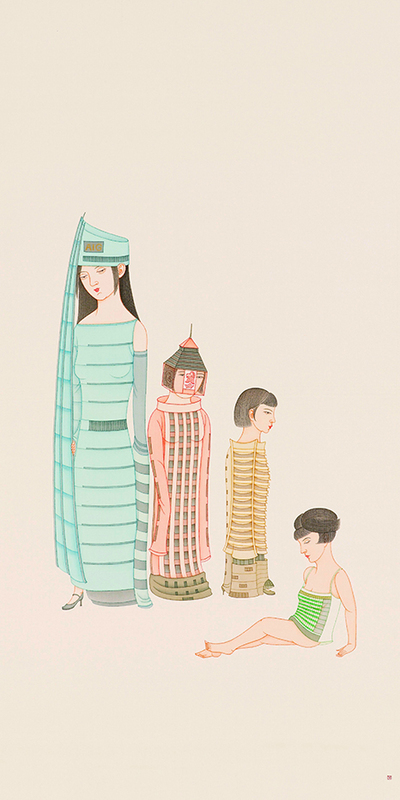 Critics have commented on the interplay between the masculinity of the architecture — especially the phallic quality of the skyscrapers — and the femininity of the women transposed on them, lined up like beauty pageant girls. It’s a quiet critique, but a critique nonetheless: Shieh subtly derides the egomania of the corporate world that has imposed itself on Hong Kong’s landscape. The skyscraper women first appeared in Shieh’s mind when he was wandering around the streets of his city at night, looking up at the glimmering towers surrounding him, marvelling at their translucent quality. “When I was looking at them I thought about how they had a similar quality to the silk I paint on, and I wandered how it would be like to turn the buildings into dresses,” he says. That was not the easiest task. 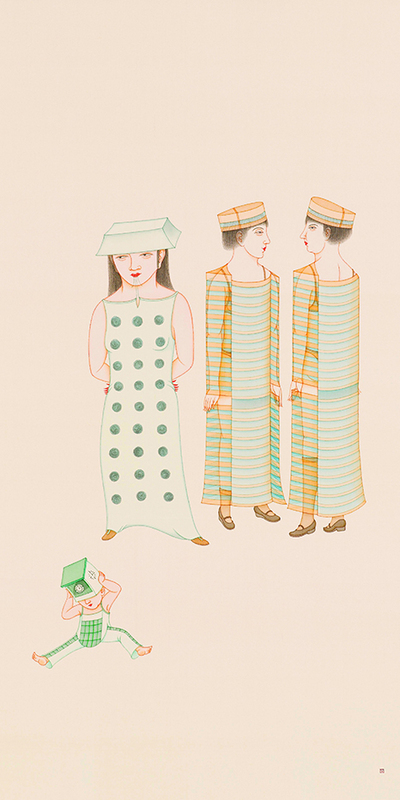 Transforming angular shapes to fit the forms of his subjects —some coy, others femmes fatales — required several attempts and adjustments before they could resemble both dresses and buildings. Part of his way around that has involved experimenting with hats that resemble Hong Kong’s singular rooftops, such as the claw-like structure atop the IFC, or the round disk perched on the Hopewell Centre. The sensual translucence evoked by the nighttime glean of these buildings is shared by the silk Shieh works on. 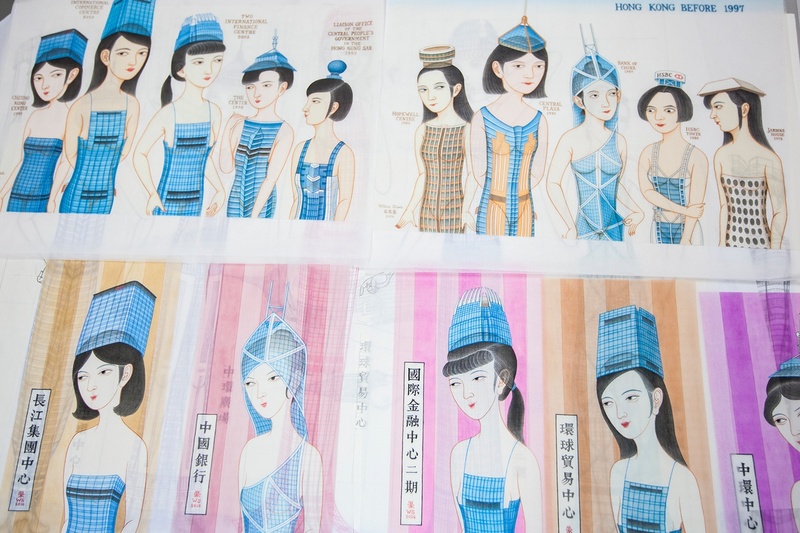 It is an homage to a material that is deeply woven into Chinese tradition. 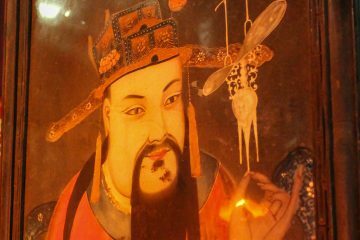 China has been painting on silk, a luxurious material originally used to clad nobility, for three thousand years. 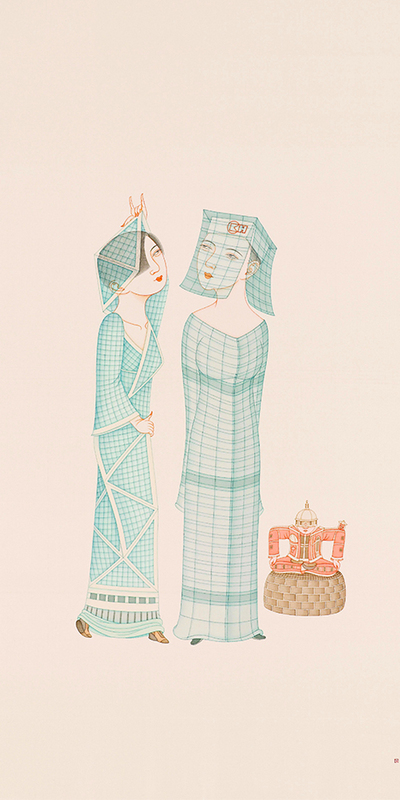 As such, both the medium and the subject matter of Shieh’s works explore ways the contemporary and the traditional co-exist in a Chinese context with transnational influences. 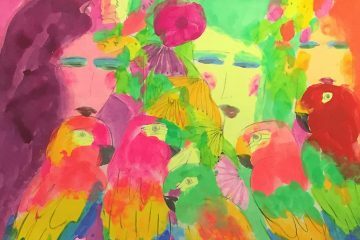 “Practising [ink art] helps me connect with my culture,” he says. Now in his forties, Shieh first became interested in traditional Chinese arts while he was in high school, first becoming enamoured in modern and classical Chinese literature as a teenager, which paved the way towards developing an interest in painting. Back then, the curriculum mirrored the British syllabus, and as such art history and technique focused exclusively on Western styles and aesthetics. 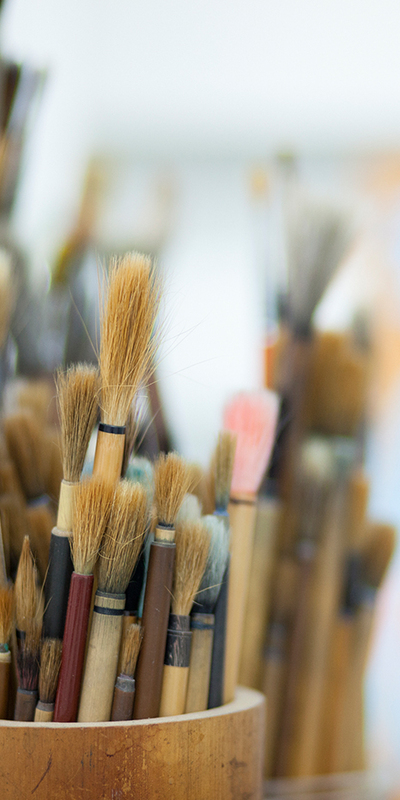 To become skilled in calligraphy and Chinese brush work of the sort Shieh employs required hiring a private teacher. Shieh himself only learnt to properly paint Gongbi style when he was at the Chinese University of Hong Kong, where he studied fine art. The city’s lack of museums also meant that accessing Chinese culture and heritage was difficult. But that has started to change as a new chapter in Hong Kong’s culture consciousness emerges. 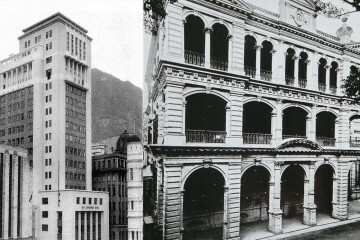 One of Shieh’s latest pieces involves comparing the architecture of pre-handover and post-handover Hong Kong. 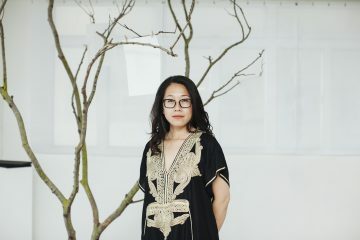 “For the last few decades, since 1997, more Hong Kong people are starting to look at their own identity. People used to focus on how to make money, and they feared life after ‘97, so a lot of people started migrating and they didn’t care about Hong Kong culture,” he says. “Now we’re looking back and trying to make sense of our identity”. Ambiguously Yours runs until May 21, 2017.